Meet our Newest Family Members!!!! “Butternut” Forget to Eat Your Veggies! Winding up with such velocity I can barely stand it! This week, our friend Jess at Wholesome living marketplace is allowing us to take over the store with some of our certified organic goodness for you to choose from! Catch me at the Station Medical Center from 10am-1:30 pm on Friday. Then I’ll swing down to Bedford at Wholesome living marketplace from 3:30-5:00. Saturday morning I’ll be in Frostburg at Mountain City Traditional Arts from 10 am-1pm. I will be baking my head off, as I have already received orders from several of you who just can’t wait to get some freshly milled, fresh baked breads grown right here on the farm. I also spotted some collard greens out in the field that need to be saved from the plow. I am bringing some micro greens and baby salad blends this week to Altoona, Bedford, and Frostburg. I want to say that we really can use the financial support through purchases right now, as we are about to embark on a very major, much needed (and expensive) barn repair. We finished the greenhouse project and the new cover and new sides have made our plants, happy, cozy, warm and very productive. I will be bringing some certified organic starts in the weeks to come. So if you plan on having a garden, check with your locally certified organic growers first, before you hit the chemical soaked everyday big box department store plants for food. Busy weeks ahead for Goodness Grows! Follow our website if you would like to receive updates as we are posting more on the blog. Also check out our facebook page, make sure you sign up to receive our latest and greatest news in your newsfeed. You may also email your documents to goodgrows@gmail.com and I will contact you to make payment arrangements that best suit your needs. Our CSA: We offer the area’s only 100% certified organic CSA from May – October (see below about our winter shares.) With the addition of our commercial kitchen certification, we can start our year strong, and end it that way as well! Early on, we will see products from our small grains, such as breads and baked goods, soy products such as vegan sausage and gluten free cookies, and animals products such as cheese, meat, and eggs. Please note–these animal products are not available to the public–only shareholders get to enjoy the goods from the barn! We are the only farm in the area to offer certified organic fruit and grains in our CSA packages. The great variety, combined with our extended growing season, makes our certified organic CSA a fantastic value. The Basics: Community Supported Agriculture (CSA) agreements are a unique relationship between farmer and consumer. CSA members pledge their support to a farm, through financial contribution and volunteer efforts, and receive weekly produce in return. As a shareholder, you become a contributor and partial owner of the farm’s harvest. Modest participation in farm activities will increase the bond between farmer and consumer, and this is our aim through our CSA program. This arrangement gives our farm more liberty to offer a wide variety of products, including meat and dairy. You own the goat, you feed the chickens (so to speak), and you reap the rewards! Contribution: The cost for a ‘half’ share is $265 plus five hours of volunteer work, a ‘regular’ share is $465 plus ten hours of volunteer work, and a ‘large’ share is $715.00 plus fifteen hours of volunteer work. For a description of the volunteer requirement, see below. For your contribution, you will receive lots of great fruit and veggies (along with occasional eggs, cheese, or meat, if that floats your boat) at convenient pick-up locations in the greater Cumberland, Maryland and Bedford areas. A half share will feed 1-2 people (we really do not recommend a half share for families larger than that), a regular share can comfortably feed a family of 3-4, while a large share is perfect for families of 6+ people or folks who do lots of canning and preserving. A deposit of $165 for a half share, $265 per regular share, and $375 for a large share is due by April 15th. If you pay the entire balance in full by March 15th, you will receive a 5% discount. Volunteer Hours: Being part of a community farm offers rich experience as well as super fresh, healthy food! Becoming a farm volunteer will give us the time to get to know you, and gives you the time to get to know where your food comes from.Volunteer hour requirements are for the whole season. Our volunteer requirement is very flexible and can be tailored to your individual needs. We understand that not everyone can spend several hours weeding on their hands and knees, and that sometimes, there are physical limitations, time constraints, etc. You can do anything from helping in the fields, to helping bundle CSA bags, to lending a hand at the market, or participating in our CSA Advisory Committee–there are many possibilities. Also, if you want to bring a friend or the rest of the family, their hours will count toward fulfilling your volunteer requirement! Please feel free to let us know about your particular wants and needs, and we will do our best to accommodate them! Contact us for other locations…We will be willing to arrange group drop off points at other destinations provided we can get enough interest! We highly encourage you to come pick up your bags at the market, if at all possible, so you can take advantage of the market-style choices when available. If you are unable to do so, you can still pick up a pre-packaged bag full of the very best of the week’s products at your regular location. Planned offerings include breads, tofu and other soy products, meats, dairy items, eggs, apples, black raspberries, peaches, strawberries, beans, peas, carrots, cauliflower, broccoli, lettuce (varieties), mesclun, herbs (varieties), tomatoes, winter and summer squash, peppers, nuts (yes, nuts! ), cucumbers, onions, garlic, potatoes, corn, beets, radishes, sprouts (varieties), spinach, eggplant, melons, turnips, tomatillos, zucchini, kohlrabi, swiss chard, sunflower seeds, and more! Each week, you can expect to see 5-8 different items in your bag. Food Allergies and Dietary Restrictions: We are aware that many people have dietary needs that do not encompass all that we have to offer. For this reason, we have our survey for each member to fill out. We do our very best to substitute items you cannot enjoy for items that you CAN enjoy. We have even grown specialty crops in our trial gardens for our vegan members and those with a delicate digestion. Please let us know if you need to refrain from any items so we can keep them out of your bag and prevent cross-contamination, particularly with nuts and other severe food allergies. Within the five years that we have offered our CSA program, we have never had an issue of cross contamination with allergens in anyone’s bags. We have also been able to successfully introduce new foods to those with restricted diets to expand their limited menus because of the bountiful variety of items we grow for our members. To sign up, download the registration forms to print and mail below. If you would like to pay by credit or SNAP benefits, please email or call me so we may arrange payment. Thanks so much and we look forward to a fantastic season working with you. We have been working on a way to provide our loyal customers with local certified organic farm fresh foods through the winter, so by popular demand we decided to offer our winter CSA package. The winter shares are on a month by month basis, and will be going to Mountain City Traditional Arts in Frostburg, MD two Saturdays a month. We will have a local farm pick up on Fridays. April will be our last month for winter shares. You may sign up anytime before the first delivery of the month. Click on the link below for more details. Snow peas, Garlic, Basil, Zucchini, Summer Squash, Lettuce, Kale, Swiss Chard, Onions, Carrots, Kohlrabi and a few cucs, peppers and eggplants are all on tap for this weeks markets. We will also have some of our award winning breads and honey, see you there. 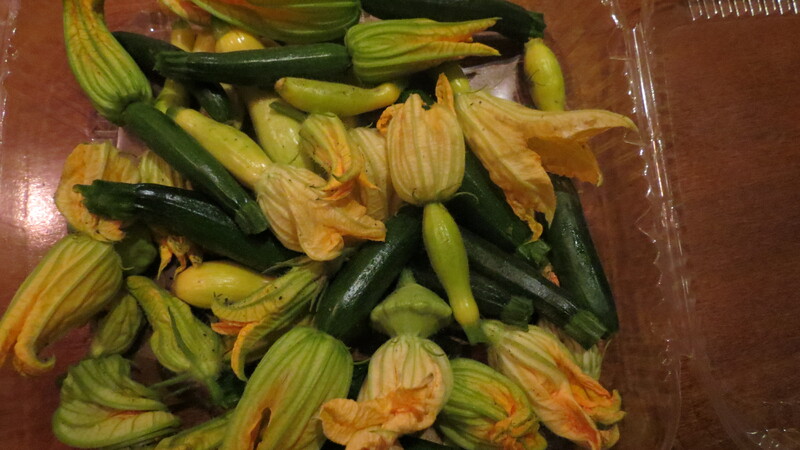 We are growing 3 varieties of zuchini and 4 varieties of summer squash for the season…. SAUTE chicken , garlic, onions, white stalks from bok Choy for 5-10 minutes in 1-2 TBL olive oil. Season with salt and pepper. Add rest of chopped greens; sprinkle with soy sauce and steam 5 minutes just til greens wilt. Stir in chili garlic sauce for a bit of spice.